I would describe myself as an occasional tea drinker, but Dh is a tea addict. So I try to make him tea every once in a while. Recently, while I was in the store looking for a black tea for my hair, I saw the Republic of Tea- Raw Green Plantain Coconut Tea while browsing the aisles. I love plantains! 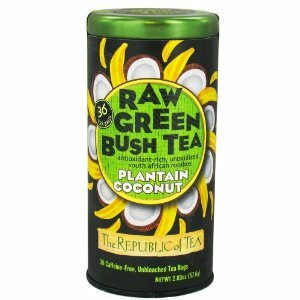 Thus, the foodie in me couldn't resist the thought of having a tea that taste like plantains and coconut. 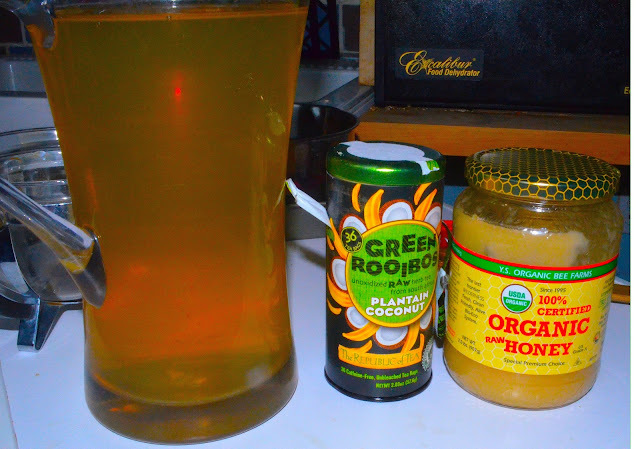 This tea is so refreshing...I felt like I was back in Jamaica sitting on the beach having an island drink. Then I woke up...Oh well at least I have pictures. From the Manufacturer: Smooth and mellow raw green rooibos makes an ideal base for a traditional island duo - sweet plantain banana with a touch of fragrant coconut. Low in tannins, it's like a vacation in a cup - hot or iced.